The government of Saudi Arabia introduced several development plans such as Saudi Vision 2030 and the National Transformation Plan 2020, with the objective of accelerating growth and diversification of the national economy. Such initiatives would help the non-oil sector to grow and promote the development of commercial buildings, offices, healthcare centers and hotels in the future. Hence, the Saudi Arabia Building Energy Management System Components Market is expected to grow consequentially during the forecast period. 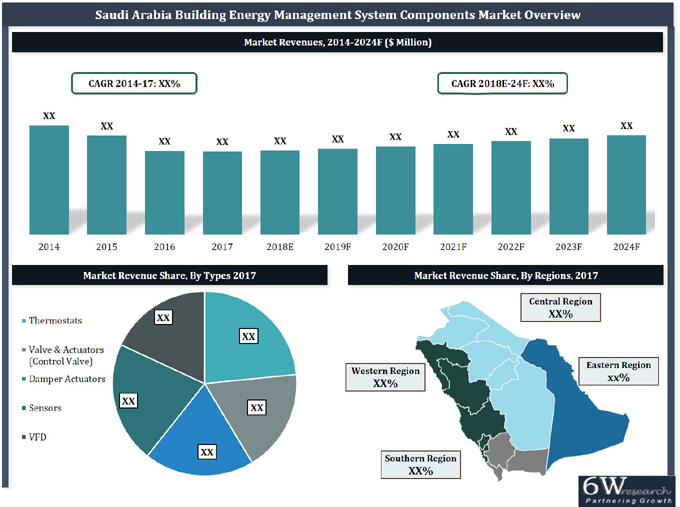 According to 6Wresearch, the Saudi Arabia building energy management system components market size is projected to grow at a CAGR of 2.8% during 2018-24. The development of large entertainment cities in several regions of the country, such as Riyadh and Jeddah, would involve the construction of new healthcare centers, hotels, commercial buildings and other social infrastructure, which would drive the market achieve a steady growth in the forecast period. Building energy management system components are a basic requirement in the designing of an automated building, where these are used on large scale for regulating various HVAC functions. Healthcare and hospitality registered the highest Saudi Arabia building energy management system components market share in 2017, where these are employed to regulate the air flow round the clock. The Saudi Arabia building energy management system components market report comprehensively covers the Building Energy Management System Components Market by type, applications and regions. The Saudi Arabia Building energy management system components market outlook report provides an unbiased and detailed analysis of the Saudi Arabia building energy management system components market trends, opportunities/high growth areas, market drivers which would help the stakeholders to device and align their market strategies according to the current and future market dynamics. Revenues for the Period 2014-2017. Building Energy Management System Components Market Size, By Revenues, Until 2024. •	Historical Data of Saudi Arabia Thermostats Market Revenues for the Period, 2014-2017. •	Market Size & Forecast of Saudi Arabia Thermostats Market Revenues, until 2024. •	Historical Data of Saudi Arabia Thermostats Market Revenues By Types for the Period, 2014-2017. •	Market Size & Forecast of Saudi Arabia Thermostats Market Revenues By Types, until 2024. •	Historical Data of Saudi Arabia Thermostats Market Revenues By Technology for the Period , 2014-2017. •	Market Size & Forecast of Saudi Arabia Thermostats Market Revenues By Technology, until 2024. •	Historical Data of Saudi Arabia Thermostats Market Revenues By Verticals for the Period, 2014-2017. •	Market Size & Forecast of Saudi Arabia Thermostats Market Revenues By Verticals, until 2024. •	Historical Data of Saudi Arabia Valves & Actuators Market Revenues By Types for the Period, 2014-2017. •	Market Size & Forecast of Saudi Arabia Valves & Actuators Market Revenues By Types, until 2024. •	Historical Data of Saudi Arabia Valves & Actuators Market Revenues By Verticals for the Period, 2014-2017. •	Market Size & Forecast of Saudi Arabia Valves & Actuators Market Revenues By Verticals until 2024. •	Historical Data of Saudi Arabia Damper Actuators Market Revenues By Types for the Period, 2014-2017. •	Market Size & Forecast of Saudi Arabia Damper Actuators Market Revenues By Types, until 2024. •	Historical Data of Saudi Arabia Damper Actuators Market Revenues By Verticals for the Period, 2014-2017. •	Market Size & Forecast of Saudi Arabia Damper Actuators Revenues By Verticals, until 2024. •	Historical Data of Saudi Arabia Sensors Market Revenues By Types for the Period, 2014-2017. •	Market Size & Forecast of Saudi Arabia Sensors Market Revenues By Types, until 2024. •	Historical Data of Saudi Arabia Sensors Market Revenues By Verticals for the Period, 2014-2017. •	Market Size & Forecast of Saudi Arabia Sensors Market Revenues By Verticals, until 2024. By Types for the Period, 2014-2017. Revenues By Types, until 2024. By Verticals for the Period, 2014-2017. Revenues By Verticals, until 2024.
by Regions for the Period 2014-2017. Revenues by Regions until 2024. •	Market Drivers and Restraints. •	Saudi Arabia Building Energy Management System Components Market Trends and Developments. 15.3 AVK Saudi Valves Manufacturing Co. Ltd.